I watched Ant-Man 2 the other night, still dreaming of Evangeline Lily. wow, this is really good. my only complaint is the holding lines in the background are too thin. I suggest you beef up those lines but then you would also have to beef up the wasp's holding lines too. good work. is this digital? Ditto on the background line weights. Plus I feel like the background looks too CG and could use more of your artistic hand in it. Also, if that's in the computer shouldn't there be more of those connecting circuit lines? Love the pose and character art! 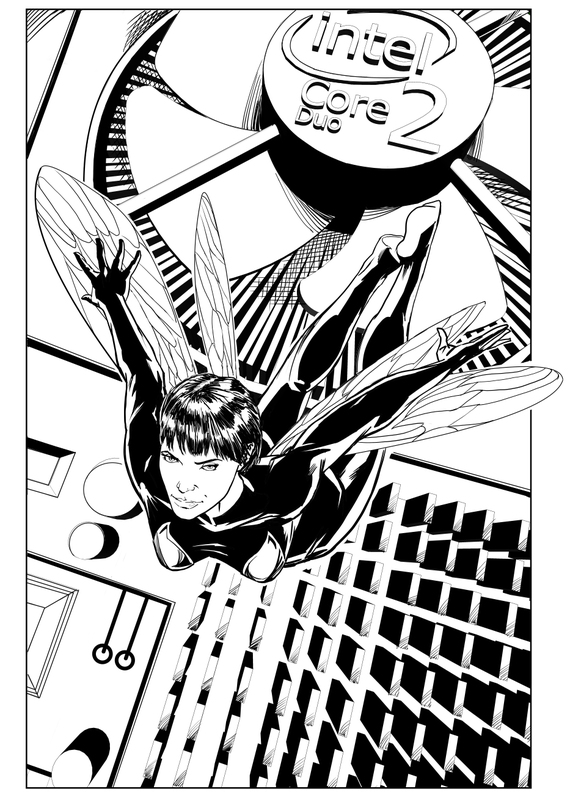 Maybe a blur effect on the background to simulate depth of field would make wasp pop out of the page more. ok, I added some weight to bg and suggested the circuits like Danny said. very much improved. i.m going to be very nit picky from here but the crosshatch does not work for me. you could substitute with a tone. i like the lines added to the fan, however the lines on the squares at the bottom should go as i really liked the look from before. very cool work.